Don't be fooled by the broadleaf evergreen behind the fence. It was 20 degrees F. outside when I took this picture. The bird is an American tree sparrow, Spizella arborea. One of the first things I did when the polar vortex hit New York City was to stock up on birdseed. 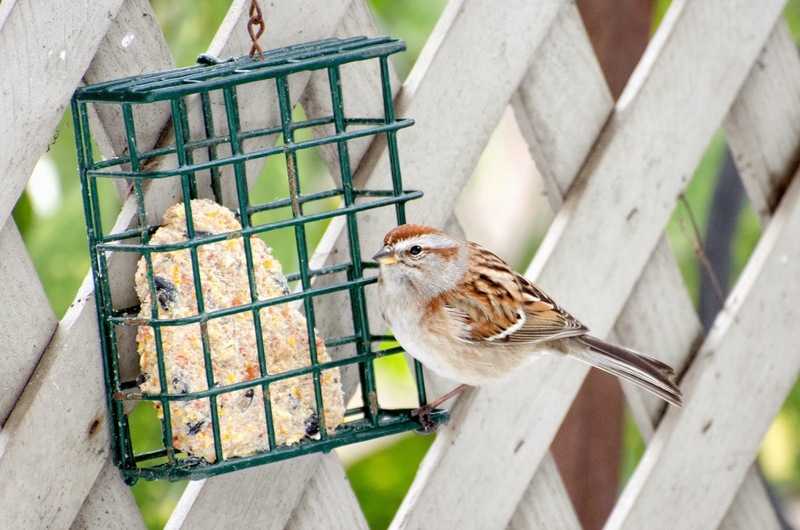 I'm not alone in that; sales of food for wild birds spike during cold weather. I've had a wire holder for a suet block for a long time, but haven't used it much. It was so cold that I decided to buy a suet and seed cake to give the birds some high-calorie food to help them keep warm. I found a single suet cake online for about five dollars. Then I found some on wag.com for $14.99 a dozen. So now I have a case of peanut-crunch suet cakes. The very first day I put one out, I was visited by this American tree sparrow. I had never seen one on my porch before! 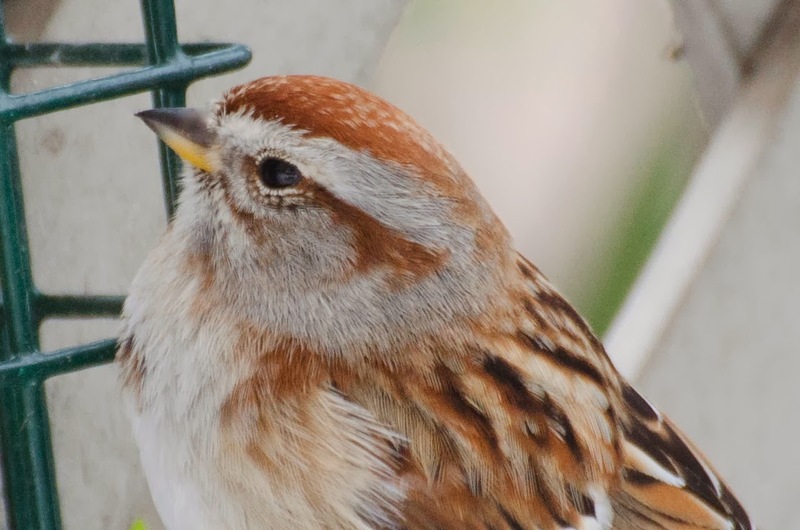 The bird is the size of a house sparrow but has a rusty cap and a rusty line through its eye on an otherwise gray head. It has a smudged spot on its breast. The beak is black on top and yellow below. Despite the common name given to it by European settlers who were reminded of another bird, this one usually forages on the ground. It also nests on or near the ground in the far north, near the tree line. That was $14.99 well spent!